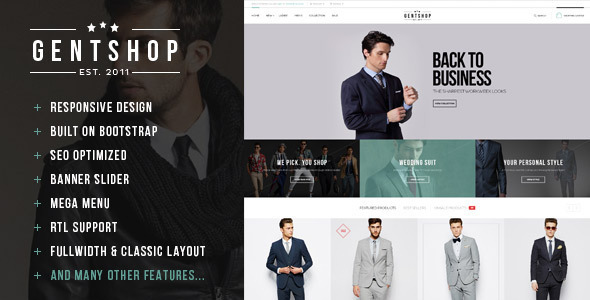 Pts Gentshop is a Responsive Prestashop 1.6 Template suitable for Hightech products Shop, Fashion and all kinds of marketplace business that needs a feature rich and beautiful presence online. This Prestashop 1.6 Theme is built SCSS and bootstrap version 3.x to make fully responsive theme that works perfect on all kind of resolutions as well for mobile, tablet, desktop having medium and large screen. With powered by the framework the theme support you many great tools to customize theme via using Live Theme Editor, Auto loading custom css files support you creating unlimited of theme profiles without code very easy and simple. This Template included three skin colors with multiple blocks combined with parallax features, great Slideshow Module having many Animation JQuery Effect, Google Fonts, Power Megamneu Module having great design Make Mega Column Tool and many other nice modules. Note: !!!! This theme is installed via BackOffice / Preferences / Theme. This entry was posted in ecommerce, fashion, prestashop and tagged clothes, fashion, handmade, live customization, megamenu, prestashop, responsive, responsive template by Acty. Bookmark the permalink.